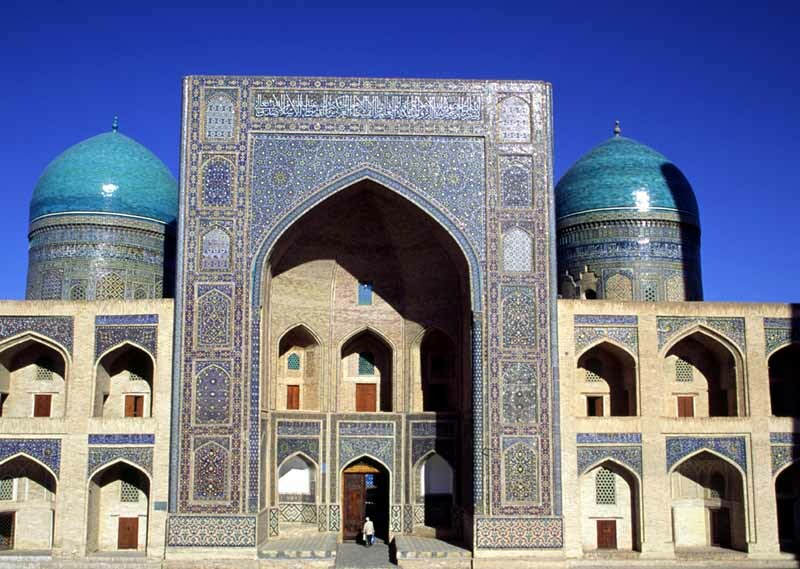 From the blue-tiled splendour of Tamerlane’s Samarkand to the holy city of Buhkara, boasting a mosque for each day of the year, and beyond, the romantic desert-girdled khanate of Khiva, Uzbekistan lays claim to a breathtaking architectural legacy. Such splendours have attracted and astonished visitors since ancient times and this detailed journey is planned to allow time to relax and fully appreciate these awe inspiring fabled cities of the Silk Road. Time is spent in the beautiful Ferghana Valley, in the heart of Uzbekistan, home to distinctive local architecture and traditional crafts from silk-weaving to pottery. Evening departure from Heathrow Terminal 4 with Uzbekistan Airways for our direct flight to Tashkent. Spending the morning in Samarkand, we visit the beautiful 14th century mausoleum complex of Shah-I-Zinda and Samarkand Paper Mill “Konigil Meros” where you can observe the traditional way of production of silk paper in traditional paper mill with a water-wheel on the banks of the river Siab.